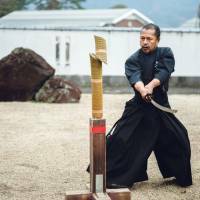 For years I’ve heard that Japanese swords are special, but I couldn’t have told you why. It was only on a recent trip to Shimane Prefecture that I learned that the legendary strength and beauty of the Japanese sword begins with an ancient steelmaking process called tatara. 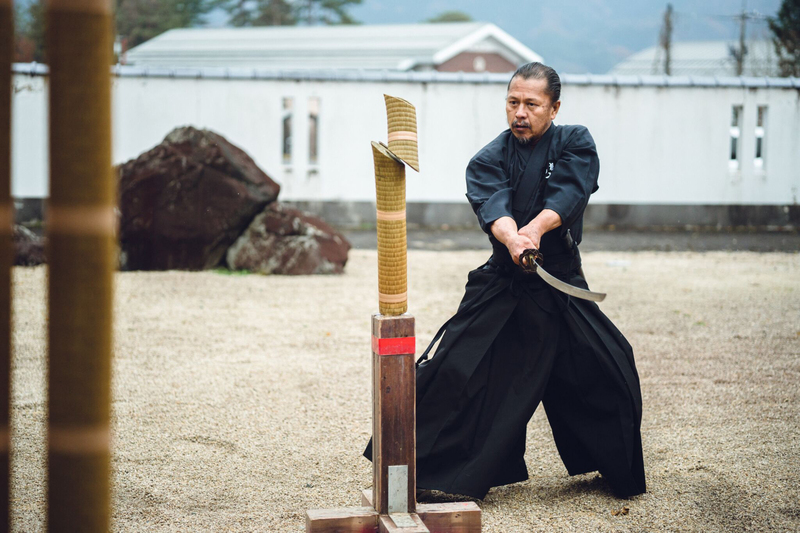 Shimane is the only place in Japan where the tradition is kept alive; one mountain town is now the exclusive source for the top-quality steel — called tamahagane — needed by craftsmen who make swords. 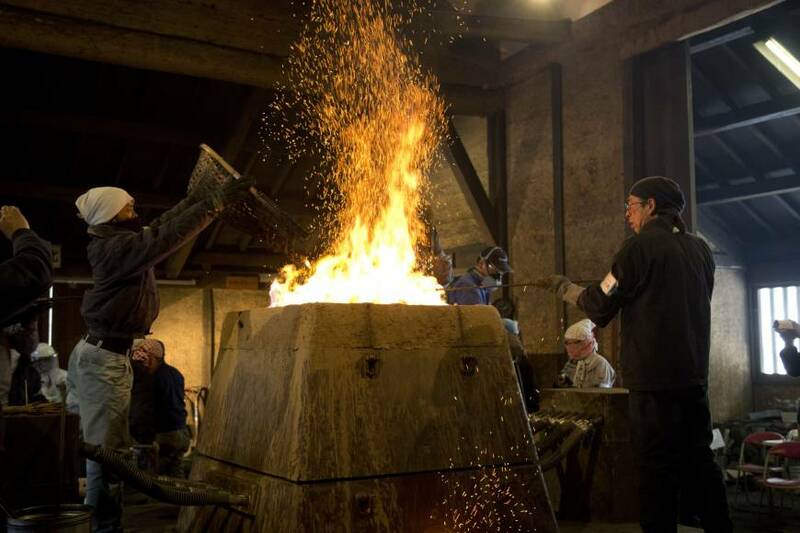 No one knows precisely when ironmaking began in Japan, but scholars believe people learned how to make iron during the Yayoi Period (200 B.C.-250 A.D.). While modern steelmaking relies on iron ore, processed in blast furnaces fired with coking coal, traditional Japanese steelmaking used iron sand as the main raw material. 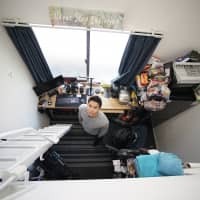 Plentiful in Shimane and other parts of western Japan, iron sand was collected from mountain areas and smelted in furnaces fueled by charcoal made from trees in nearby forests. One production cycle required 13 to 15 tons of charcoal and as much iron sand, yielding 3 to 4 tons of pig iron and steel. The work was demanding and dangerous, requiring three days and nights of round-the-clock labor. Air had to be pumped into the fire continuously to keep it hot. This was accomplished with powerful bellows operated by as many as six men at once. The result was a huge slab of crude steel, which was broken up, sorted and further processed. Only a small amount was good enough to be classified as tamahagane. 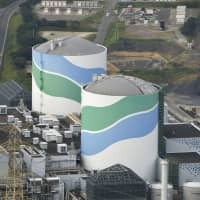 The Chugoku mountain area that includes present-day Shimane was once the largest steel-producing area in the country, shipping it across the country. But when Japan ended centuries of isolation in the mid-19th century, new technologies were introduced from the West. The first Western-style blast furnace for steelmaking was built in 1857 and, by the turn of the century, tatara production faded in importance and soon disappeared completely. With it, the secrets of making tamahagane were forgotten. Decades later, this was recognized as a crisis for sword makers, as it became clear that swords made with Western-type steel, which is more consistent, did not have the distinctive forging patterns that are considered key to the beauty and value of a true Japanese sword. In the years either side of World War II, efforts were made to revive tatara production. 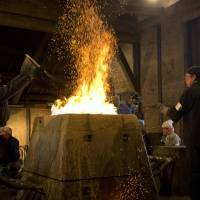 Today, The Society for Preservation of Japanese Art Swords, in cooperation with Hitachi Metals Ltd., maintains a forge in the town of Okuizumo, running three production cycles every winter. They make enough tamahagane to supply sword makers while also training future craftsmen in tamahagane production. 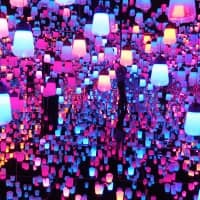 To share this fascinating earlier technology, I’ve put together a self-guided tour that will work for a visitor with little or no Japanese. It’s best done as a drive-yourself adventure because public transportation, particularly between locations, is limited. Shimane is one of the least-visited prefectures in Japan, still largely undiscovered by tourists, but the start point for this adventure is only about a two-hour drive from Hiroshima and four hours from Osaka. If you’re flying, there are direct flights from Tokyo’s Haneda Airport to Izumo and Yonago airports, and regular nonstop service to Yonago Airport from Hong Kong and Seoul. Start at the Historical Museum of Iron (Tetsu no Rekishi Hakubutsukan) in the Yoshida area of Unnan City, once a thriving center for iron production. The museum is small and old-fashioned, with little English used in its displays. 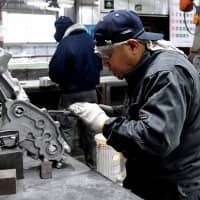 However, thanks to a movie they have on hand, made in the 1960s by the Iron and Steel Institute of Japan, it’s the best place to get a thorough introduction to the tatara process. Ask the staff to put on the English version, and budget about an hour at the museum, including time to check out the exhibits upstairs. On your way in or out, take note of the 2-ton slab of crude steel outside the entrance. This is a called a kera and is what comes out of the smelting furnace. Next, drive about 10 minutes to the Sugaya Tatara Takadono, the only surviving example of a traditional iron forge (takadono). 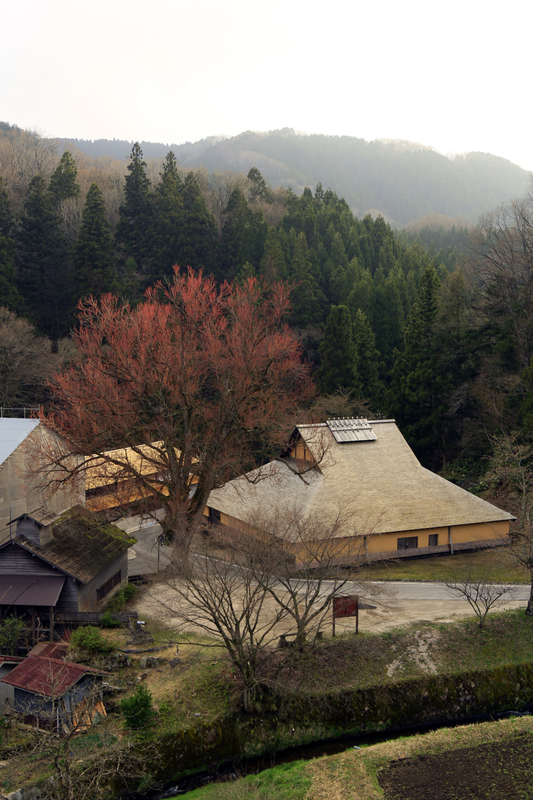 It’s a beautiful structure, with an elegant roof of wood shingles, that anime fans will recognize as the model for Irontown in “Princess Mononoke,” the 1997 animated film by Studio Ghibli. Inside is an earthen-floored space with a vaulted ceiling, in the center of which is a clay furnace. I was surprised at how small it is — a box-like construction about 3 meters long and 1 meter wide that reminded me of an oversize Japanese bath tub. 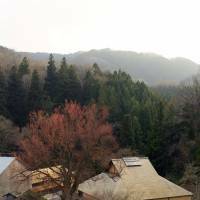 To get a sense of the scale of traditional steelmaking during its heyday, and the wealth it generated, visit the Sakurai Family Samurai House, the home of one of the powerful local families that ran tatara operations. The Sakurai home is in a lovely location by a ravine with pools of water. 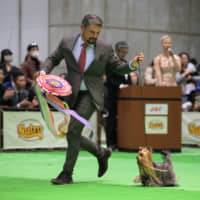 From April to November, you can pay a little extra to be admitted into a formal reception area, normally off-limits to visitors, where the lady of the house will serve you matcha green tea and a sweet. The rooms are beautifully appointed in understated elegance, built for a visit from Matsudaira Harusato (1751-1818), a famous tea master and the lord of the local domain. The garden, constructed at the same time, is a designated Important Cultural Property. Next, drive another half-hour through beautiful scenery to the Okuizumo Tatara and Sword Museum. There are two standout exhibits here. The first is a life-size re-creation of the complex foundation that was built under a furnace to dry the ground. Visitors can descend into a pit to study the cutaway that reveals how it was constructed. The other winner is a replica of the fuigo bellows that supplied air into the furnace. The seesaw-like structure, which visitors can mount and operate, is the same as that of the bellows pictured in “Princess Mononoke.” Time your visit right and you can also try your hand at forging, and watch a sword-cutting demonstration. The final stop is Kanayago Shrine, dedicated to the deity who oversees steel production. This god is said to be a woman who is lame, and blind in one eye. The shrine is the head shrine for more than 1,200 Kanayago shrines throughout Japan, and steelmaking companies still send regular delegations to receive blessings for safe operations. If driving is out of the question, there are seasonal bus tours with pick-ups from Matsue Station and Tamatsukuri Yuyu Onsen. Departures in 2018 are on Sept. 23 and 30; Oct. 7, 14 and 28, and Nov. 4, 11, 18 and 25. Guides are Japanese-speaking only and reservations must be made at least two days in advance. The author researched the Iron Road with assistance from the San’in Tourism Organization, the Iron Road Culture Promotion Conference and the municipalities of Okuizumo, Unnan and Yasugi. Delve deeper by joining a modern-day approximation of the tatara steelmaking process, held every October. Participants experience work in shifts over a 72-hour production cycle. This is potentially dangerous work so an ability to understand Japanese is recommended. Tourism no Yado Wakatsukiya offers simple Japanese-style lodging near the Historical Museum of Iron, in a restored 150-year-old traditional building. The cafe serves lunches. (Yoshida 2566, Yoshida-cho Unnan, Shimane 690-2801; hashiman.jimdo.com). Tamamine Sanso has Japanese and Western-style rooms and indoor and outdoor hot spring baths. The chef showcases local ingredients and sake. (Kamedake 3609-1, Okuizumo-cho, Nita-gun, Shimane; tamamine.jp). For local products and sake, visit Michi no Eki Sakagura Okuizumo Koryukan. Don’t miss the amazake (sweet rice sake) soft ice cream. (Kamedake 1380-1, Okuizumo-cho, Nita-gun, Shimane 699-1701; okuizumosyuzou.com). For top-quality mementos, check out the stylish iron candlestick holders and lanterns at Kaji Kobo Hiromitsu. (Hirose-cho Fube 1168-8, Yasugi, Shimane 692-0623; kaji-hiromitsu.com/e).